This interactive toy encourages your cat to enjoy natural prey-stalking instincts while encouraging the active exercise and mental stimulation all cats need. 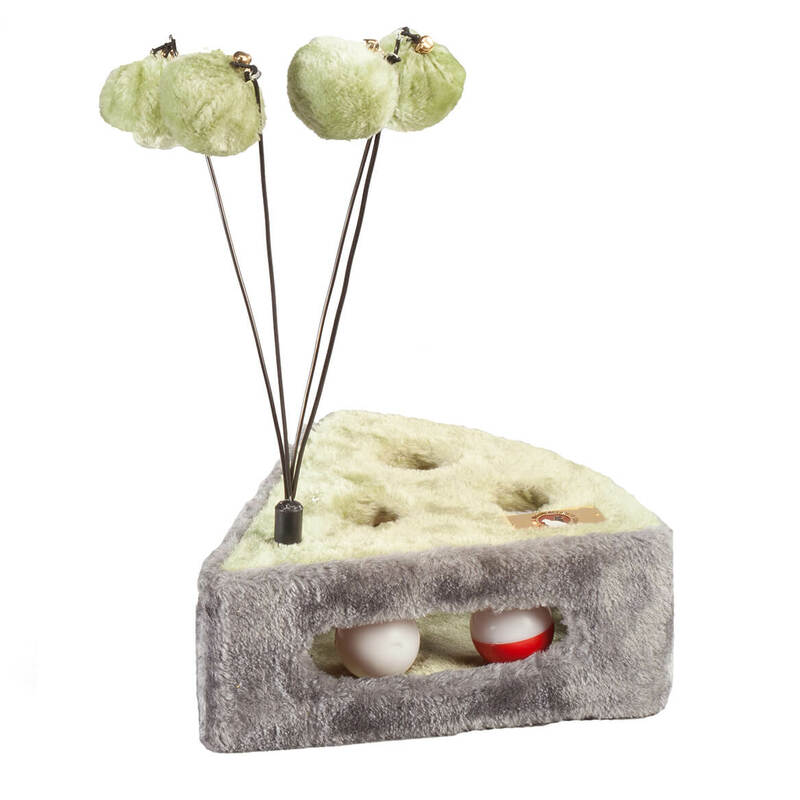 Four fun teasing balls keep kitty engaged in play—enticing her to stalk and pounce on the moving targets, batting with abandon, then coming back for more. 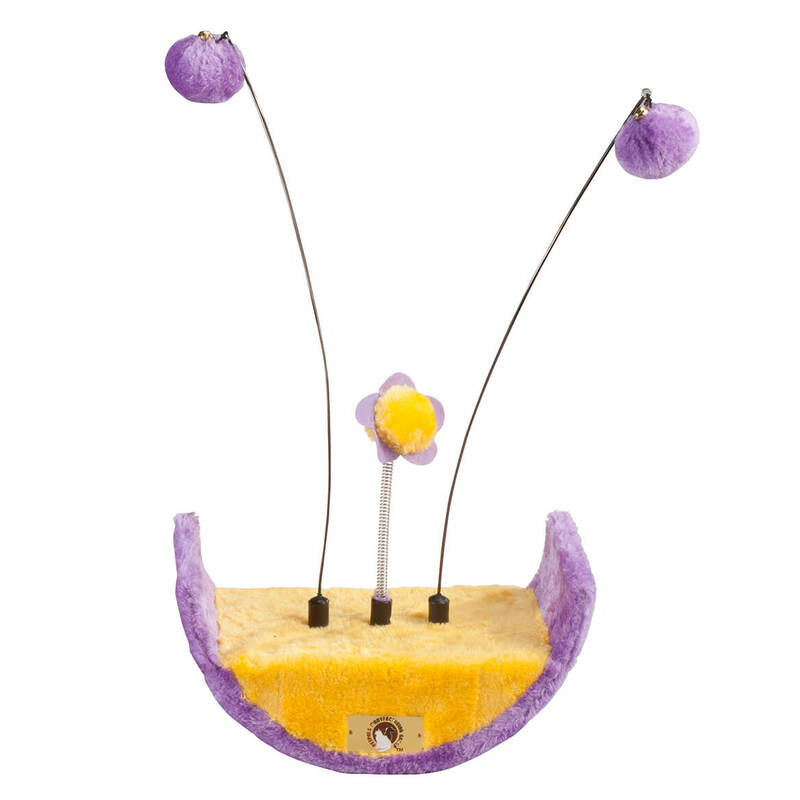 For added fun, Pizzazz Kitty Carnival’s wedge-shaped base includes 3 cut-out holes you can drop balls or treats into, then watch your cat try to fish them out. Includes 2 plastic balls. Designed in fleece; all materials are manufacturer tested using international safety standards. 10″ wide x 4″ high x 8 1/2″ deep. Allow 2-3 weeks. No express shipping. 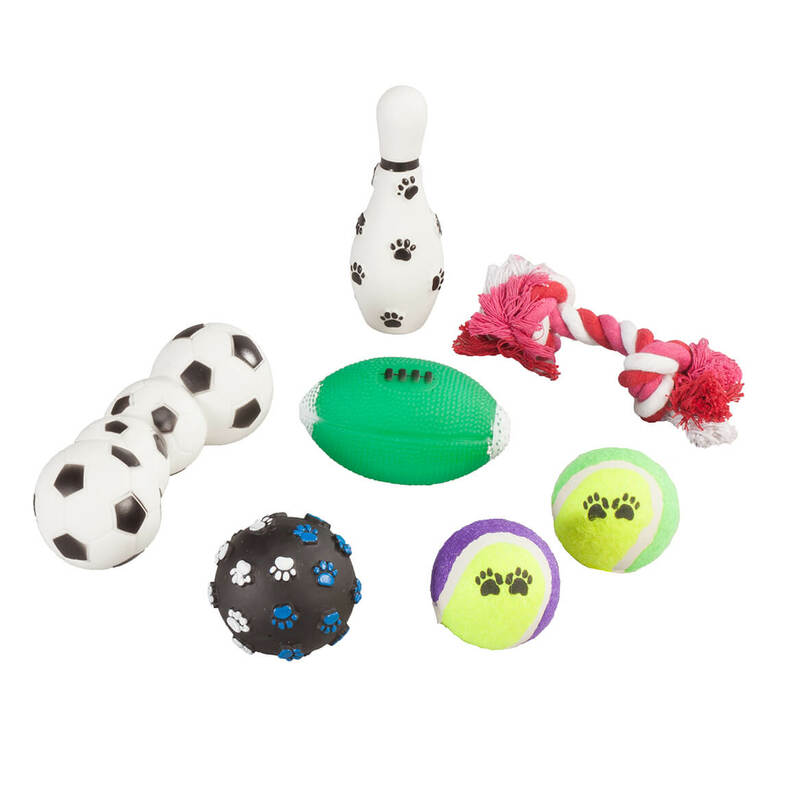 Give your playful pooch everything needed to stay busy, active and entertained with this Sports Pet Toys 7-Pc. Set! Great for fetching, chasing, tugging and enjoying interactive fun with you, this dog toy set includes 1 rope toy, 2 tennis balls, 1 bowling pin, 1 football, 1 soccer ball toy and 1 textured ball covered in cute paw prints. Clean before use; hand wash only. 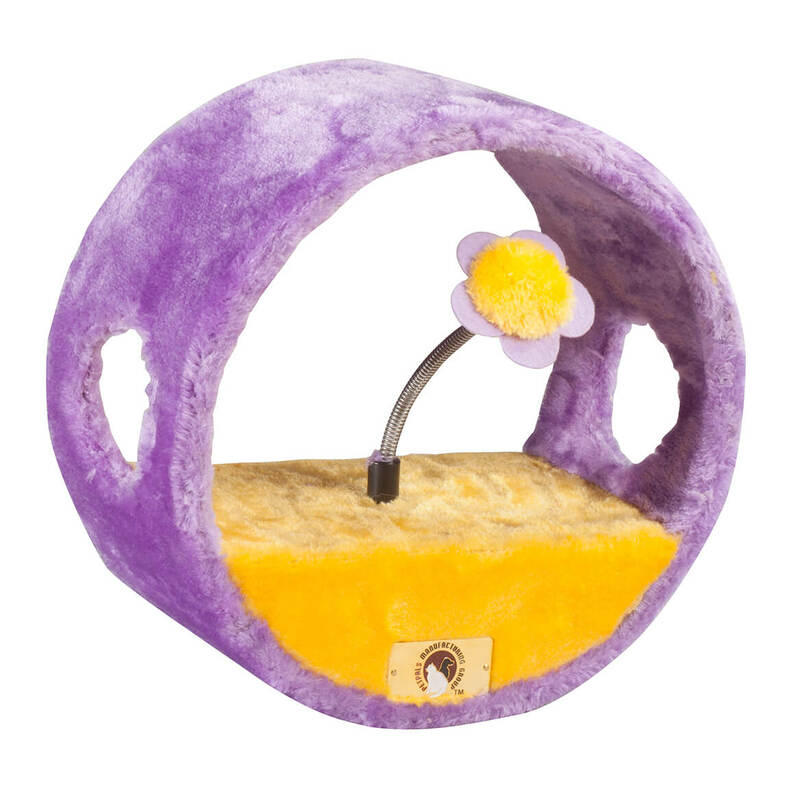 Enticing your cat to engage in hours of solitary play, this interactive toy provides mental stimulation and healthy exercise—even when you’re away! Accompanied by jingling bells for added fun, Stumpy Kitty Carnival’s soft, plush-covered teasing balls appeal to kitty’s natural instinct to stalk and pounce on their prey, keeping her interested and stimulated, swat after playful swat. Designed in fleece; all materials are manufacturer tested using international safety standards. 12″ wide x 10″ high x 6″ deep. Allow 2-3 weeks. No express shipping. 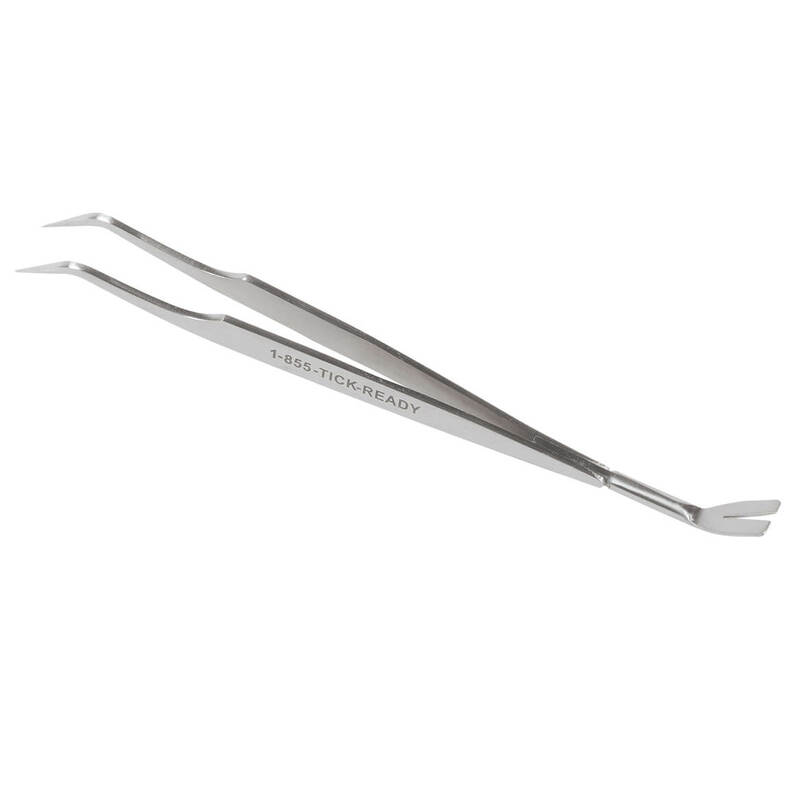 With a slotted end for pets and a thin end for people, TickEase® Tick Removal Tweezers, with their fine-tipped, pointy design, were made specifically for the effective removal of engorged ticks! The Center for Disease Control (CDC) and the Tick Encounter Research Center (TERC) at the University of Rhode Island recommend using “fine-tipped” or “pointy” tweezers for proper, effective removal of ticks for humans. Safely removing ticks of all sizes, types and levels of engorgement, the 100% stainless steel tick tweezers are a must for pet owners, nature lovers and anyone wanting to prevent tick-borne diseases with early, effective removal of ticks. 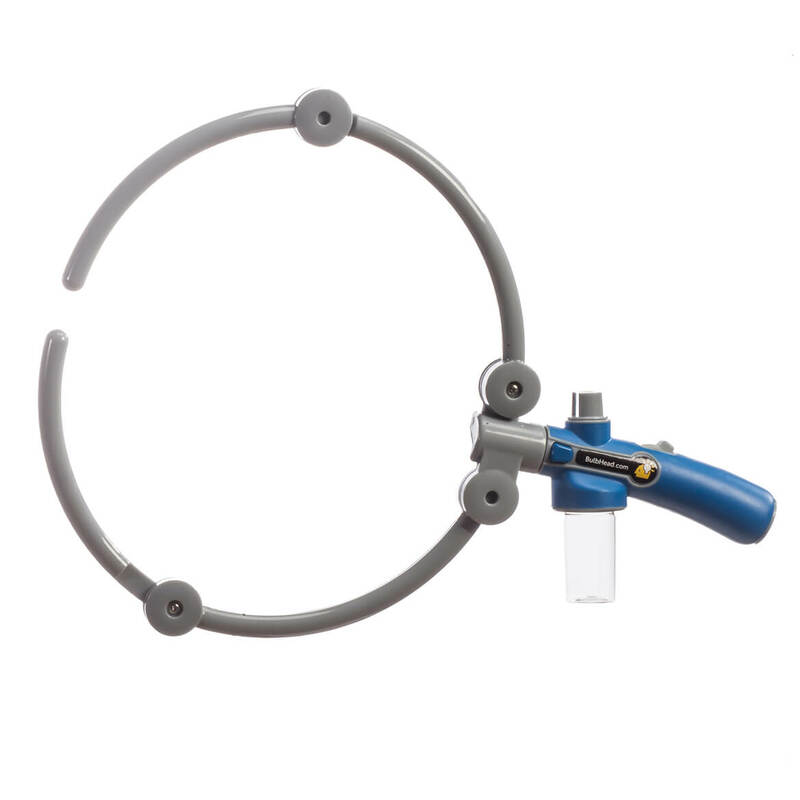 Tick removal tool measures 5 1/4″ long; includes bonus magnifier and tick testing instructions. Providing exercise essential for your cat’s overall health, this interactive toy offers challenge and active play—helping relieve boredom and anxiety when you’re away. 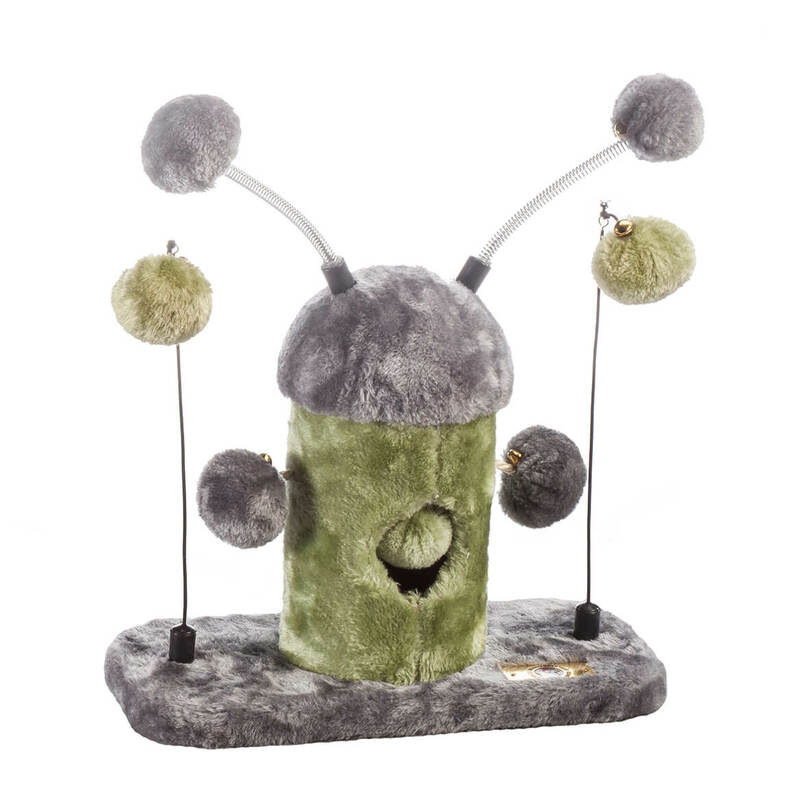 Lined in soft, cat-loving fleece, the Vortex Kitty Carnival’s round shape and springy teasing toy provide rolling, swatting fun, appealing to your cat’s natural instincts to stalk and pounce. Designed in fleece and metal; all materials are manufacturer tested using international safety standards. 11″ wide x 11″ high x 6″ deep. Allow 2-3 weeks. No express shipping. Woof Washer 360-degree adjustable dog cleaner safely and easily washes and rinses dogs of all sizes in less time than a traditional bathing method. Attach the dog bathing station to any garden hose, add the shampoo of your choice to the dispenser and you are set to go! Slip the hoop over your furry friend and quickly wash your dog from head to toe using different suds and rinse modes. Plastic. This 2-in-1 pet ottoman gives you a cushioned foot rest—giving your pet a comfy place to lounge or nap, while staying close to you. 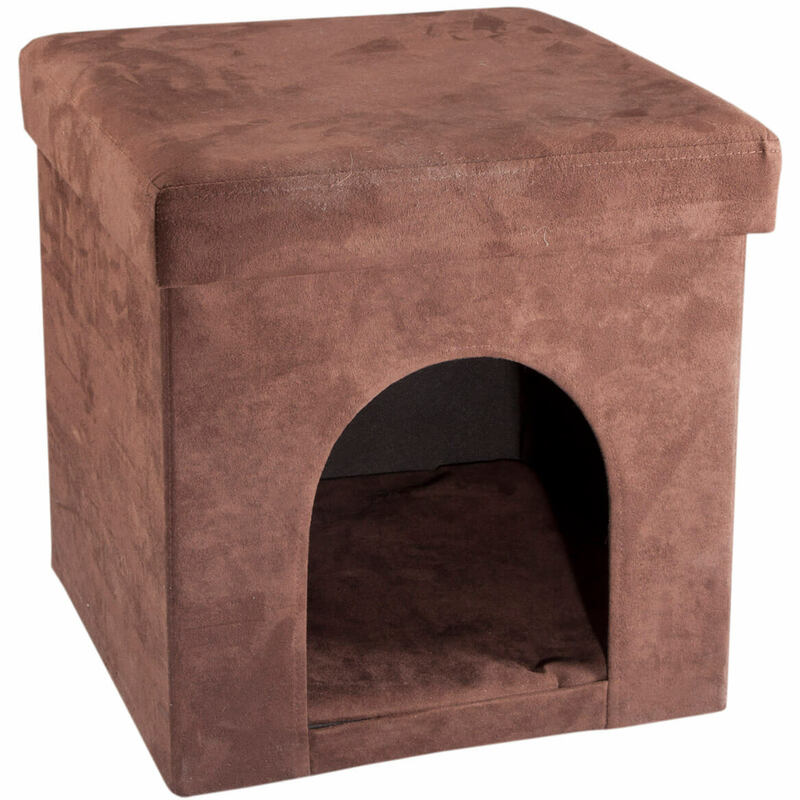 Offering small dogs and cats the secure enclosure they love, our cozy cat and dog ottoman features a roomy opening for easy entry and exit (plus removable top help is needed). Smooth suede-like finish complements any décor, and this pet-friendly ottoman folds flat for easy storage or transport. Microfiber, MDF, foam; spot clean. 15″ long x 15″ wide x 15″ high. 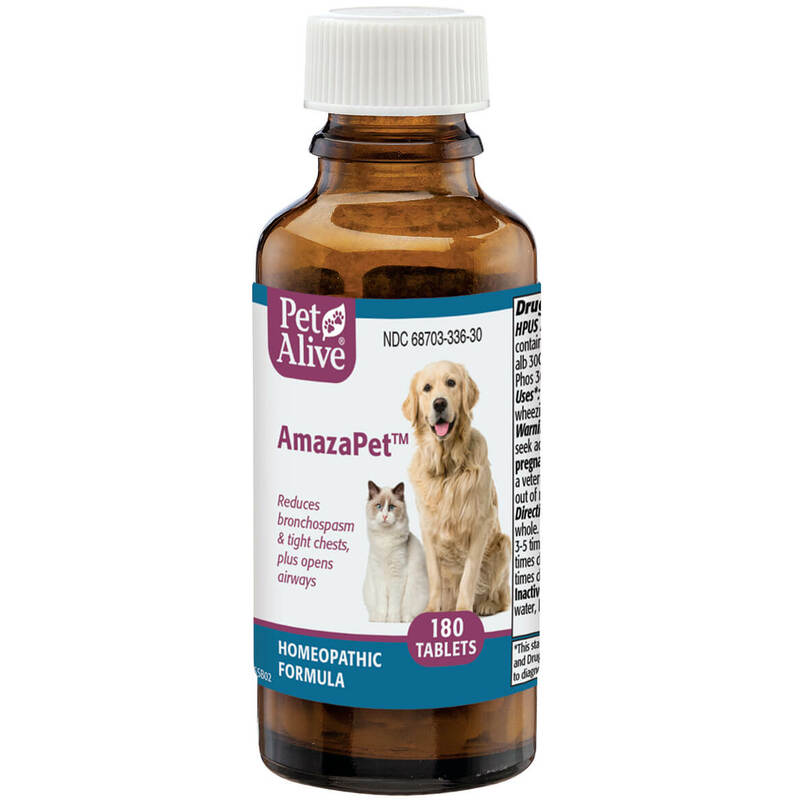 Made in the USA, PetAlive® AmazaPet™ pet supplements for cats & dogs contain a 100% natural blend of herbal and homeopathic ingredients for the treatment of asthma in pets. AmazaPet supplements for asthma reduce the frequency and severity of pet asthma attacks and improve respiratory functioning. Contains 180 pet tabs.u003cbru003eu003cbru003eAll PetAlive homeopathic products and biochemic tissue salts are manufactured according to the highest standards in a FDA-registered pharmaceutical facility under the supervision of qualified homeopaths and responsible pharmacists and comply with specifications of Good Manufacturing Practices (GMP). Individual ingredients are listed in the Homeopathic Pharmacopoeia of the United States (HPUS).u003cbru003e*These statements have not been evaluated by the Food and Drug Administration. This product is not intended to diagnose, treat, cure or prevent any disease. Helping naturally discourage your dog’s problematic barking, this safe, easy dog barking training aid sends an ultrasonic signal to interrupt the barking pattern. Simply place the compact bark control unit in any room of your home or an outdoor area covering 20 ft. (high setting) or 10 ft. (low setting). When its microphone picks up your dog’s nuisance bark, it emits a high-pitched tone audible to dogs, but not most people—and most dogs learn to associate nuisance barking with that unpleasant tone, which should help the problem. 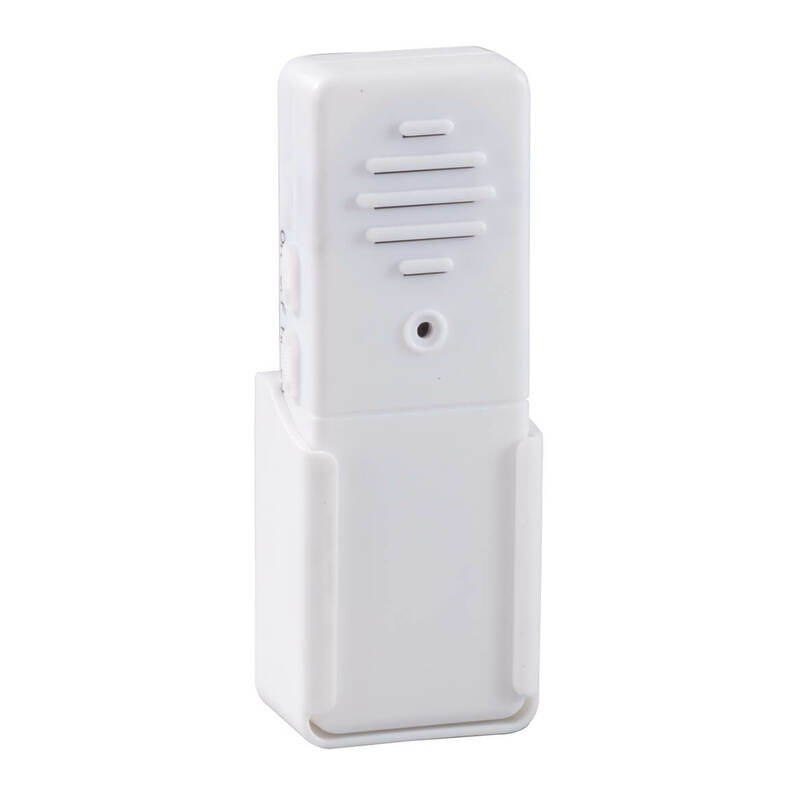 A safe, collar-free option for controlling barking in young or older dogs, the durable plastic dog barking deterrent requires one 9-V battery (not included). 5″ long x 1 1/2″ wide x 1″ high.